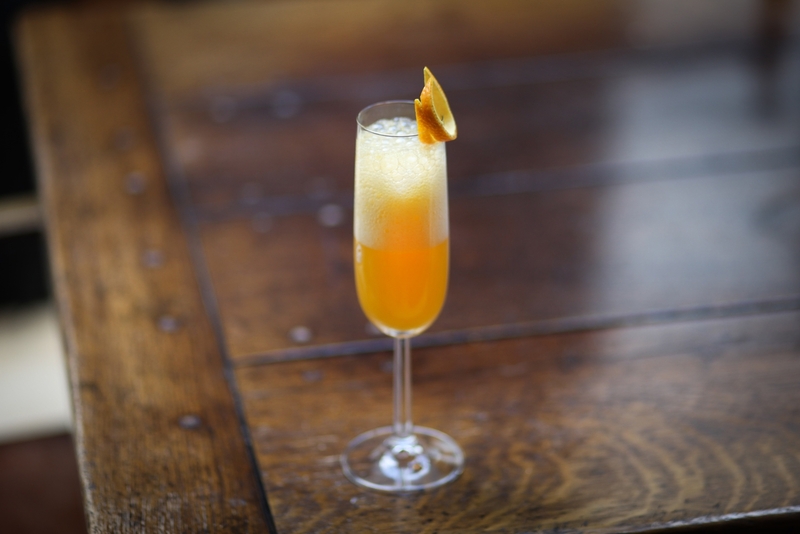 The Buck’s Fizz and Mimosa are very similar cocktails, the Buck’s Fizz is made with two parts champagne to one part orange juice, while the Mimosa is made with equal parts champagne and orange juice. The two drinks are further distinguished by the Mimosa being served in a wine glass over ice while the Buck’s Fizz is served without ice in a flute or coupe. In the UK, where the Buck's Fizz originated, the drink was huge during the 1980s, to the extent that pre-mixed bottled versions appeared in supermarkets, where they are still sold to this day. The Buck's Fizz also became the fashionable wedding day drink-on-arrival, made en masse by caterers with warm cartoned concentrate orange juice. Indeed, bad orange juice and cheap sparkling wine have been responsible for the near death of the Buck's Fizz and the Mimosa. A sunny afternoon is a great time to appreciate a refreshingly light Mimosa while the Buck's Fizz is a great brunch drink. To get through the endurance test that wedding receptions so often are, I for one need something a bit stronger.